Closeup of a Neputa float. 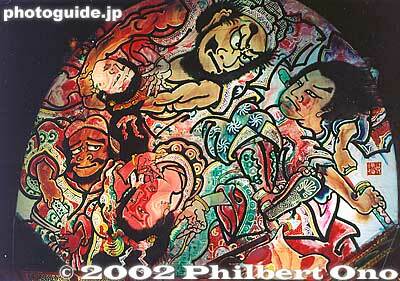 Theories concerning the origin of the Neputa are identical to those of the Nebuta. However, in the 1880's, the Neputa gradually changed from human figures into a fan shape. The floats have come a long way since then. Candles have been replaced by generator-powered lights and the washi paper has been replaced by washi paper blended with nylon. The festival is designated as an Important Intangible Folk Culture Asset.